Here at Bushfield School, we have been using Building Learning Power for several years now (the version of Bristol’s original research popularised by Guy Claxton via TLO). We’ve had some success at embedding it within the school’s ethos and everyday practices, according to a TLO audit, and reassuringly, confirmed by Ofsted. In parallel, we subsequently learned about the ongoing research programme at Bristol, around ELLI, led by Ruth Deakin Crick. Now we’re exploring ways to build on the language for learning that is part of the school’s life, and introduce ELLI as a way of opening up conversations around learning power at the individual pupil level. 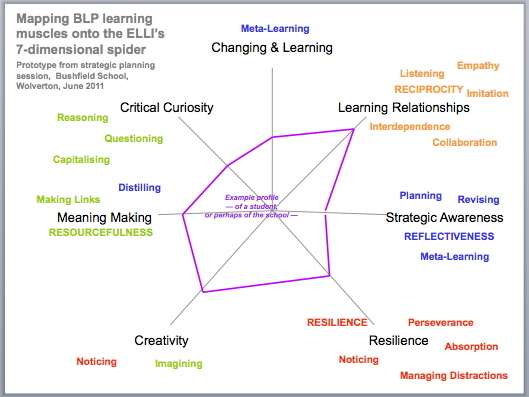 An initial step has been a simple exercise in which we mapped the BLP “learning muscles” which our staff and students are now familiar with, onto the ELLI spidergram generated from the self-report web questionnaire hosted by Vital Partnerships. We might add in the icons for learning muscles around the spidergram to add more visual engagement as well, similar to the way in which the ELLI team have engaged young people in diverse cultures through the use of the Simpsons characters, and indigenous Australian animals. This is precisely how we envisaged the BLP approach ( the three Rs) would feed into the seven dimensions of learning power when the University of Bristol team worked with TLO team back in 2003/4 in an attempt to reconcile Guy Claxton’s early work into learning power with his later work, with Patricia Broadfoot and myself, funded by the LIfelong Learning Foundation which resulted in the ELLI instrument. As time has gone by and the data behind the seven dimensions has been validated and published in many studies, and with samples of over 50,000, it has also become clear that the real value in the ELLI spider diagram is as a framework for a conversation with the individual which moves between their sense of learning identity and their desired learning pathway. It’s foundation in empirical research means that the language it provides is focused and meaningful – and the seven dimensions are important and substantial developments in the principles and practices of learning design for building learning power. The seven dimensions of learning power enable authenticity, identity and agency to become a practical focus in pedagogy. Hi, this is really good and exciting, as it is so clear that these different expressions of Learning Power are complementary and arriving at the same point by different routes. I feel encouraged to try and flesh out the ‘map’ with some more of the associations that flesh out each of the dimensions: for Changing & Learning, we could add: reflecting, deciding, understanding myself; for Critical Curiosity, we could add: challenging, deepening, stretching; for Mmeaning Making, we could add: spanning and connecting, and I think noticing comes in here; for Creativiy: hunch-making, thinking out of the box, dreaming; for Resilience: determination, persistence, self-belief; for Strategic Awareness: organising, accepting responsibility, managing feelings; for Learning Relationships: self-sufficiency and teamwork. It’s a fun exercise! We should do it on several levels, with images and metaphors and stories as well as more symbolic language like the ‘learning muscles’ idea.